Henry Barker Kennington was listed as an Absent Voter in Bottesford in 1919. According to this record, he lived on Market Street, and was a private in the 267th Siege Battery. His Service Number was M/317742. Henry Thomas Barker Kennington (this appears to have been his full name) was born in 1878 at Bardney, Lincolnshire. He was the son of Thomas Kennington, who was born at Bardney around 1842-1844, and Emma Kennington, born at Burton on Stather, Lincolnshire, in 1853. In 1881, she was described as an engineer’s wife living in Handsworth (Staffordshire), with six children and a governess. In 1891, when Henry was thirteen, the family were living in Sheffield, at 279, Granville Road. Thomas was employed as a corn miller’s traveller. There were five children, the oldest being William who was 20 and employed as a shorthand clerk. Henry was the fourth child, 13 years old, a scholar. In 1911, Henry was still a boarder, but was now living in London, at 9, Trigon Road, Kennington, working as a Motor Cab Driver (i.e. a taxi driver). He was married, but his wife was not with him in London. He had married Fanny Armstrong on the 14th December, 1903, in Manningham, Bradford Yorkshire. At this time, he was a fruit salesman living in Nearcliffe Road, and she was living at Clyde Road, Sheffield, but there is no information about her occupation. It is not certain how the Kenningtons came to live in Bottesford. In Kelly’s Directory of 1912, Mrs Fanny Kennington is listed as a draper in Bottesford. It appears therefore that she took over a shop in Bottesford some time after the 1911 Census. Her husband may have come to Bottesford at the same time or later. In a 1914/15 Rent Book it is noted that Arthur Mayfield rented a shop and house belonging to Thos. (Thomas) Kennington, near The Cross. However, in Kelly’s 1916 Directory, Fanny Kennington is again listed, now as a shopkeeper in Bottesford and Mayfield is not listed. The information in the Absentee Voters list 1918/19 indicates that Henry Barker Kennington was Private M/317742, with the 267th Siege Battery, and that his home address was on Market Street, Bottesford. 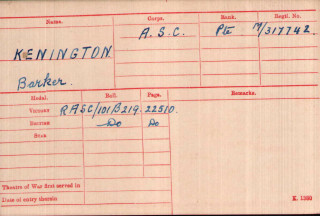 His Medal Index Card records that he was in the Royal Army Service Corps (rather than the Royal Garrison Artillery) and that he was awarded the British War Medal and the Victory Medal. 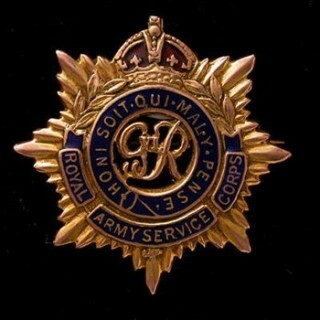 The ‘M’ prefix of his Service Number confirms that he was a member of the RASC. The website of the Wartime Memories Project describes the Siege Batteries of the Royal Garrison Artillery as being deployed behind the front line, tasked with destroying enemy artillery, supply routes, railways and stores. The batteries were equipped with heavy Howitzer guns firing large calibre 6, 8 or 9.2 inch shells in a high trajectory. RASC would have been there is a support role, typically as drivers. This website lists a great number of Siege Batteries, but not the 267th. It appears however that, in rough terms, the higher a Battery’s number the later it was deployed. Thus the 220th Siege Battery proceeded to France on the 25th of December 1916, and the 236th on the 29th of January 1917. The 295th Siege Battery, described as armed with 6 inch 26 cwt Vickers Howitzers, were in action at Messines from 7th of April 1917 until moving further north in the Ypres Salient in July, where they were in action until November 1917 in the 3rd Battle of Ypres. It adds that the war service of the 295th Battery totalled 20789 Rounds! It seems reasonable to suggest that the 267th were probably deployed in France at some date around the middle of 1917, and may well have been in action there until the end of the hostilities. Fanny Kennington ran her shop on Market Street, Bottesford, through the war years, while her husband Henry was on military service. In the 1925 edition of Kelly’s Directory, Fanny Kennington is again listed a shopkeeper, whose premises were on Market Street by the Cross. Electoral Rolls also indicate that in 1923, Henry Barker and Fanny Kennington were together on Market Street, and that they remained there at least until 1926. However, in the Roll for 1928 they were living at The Lodge, Carlton Scroop, Lincolnshire, and there are no Kenningtons recorded in Bottesford Kelly’s Directory of 1928. Henry Barker Kennington died on the 11th January, 1958, aged 80, at The Retreat, Littleton, Winchester. Probate of his will was granted in April, 1958, in Nottingham, to Robert Armstrong Barker Kennington, Farm Steward and to Alex Edward Sellers, solicitor. Henry Barker Kennington left £1392 19s 10d. 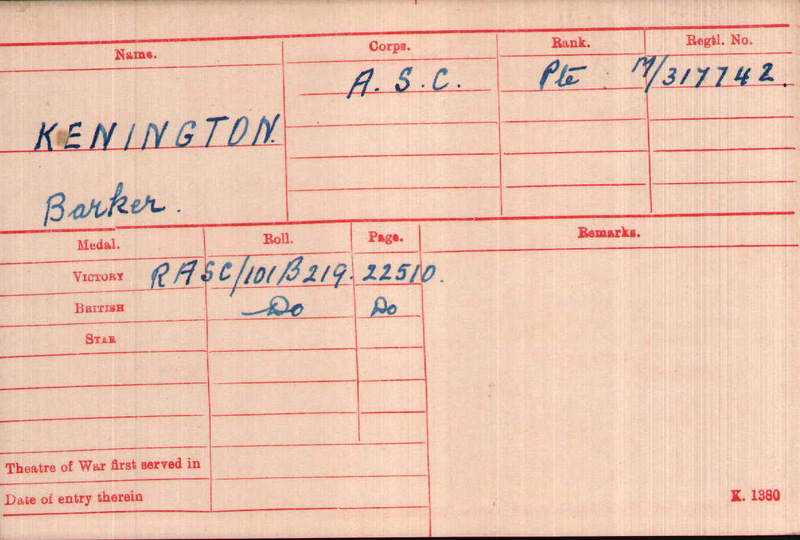 Service record information is poor for this soldier, for instance the movements of the 267th Siege Battery and the role of the ASC with regard to this unit. In addition, we do not have information regarding Private Kennington's Attestation and joining up, nor of his discharge.